Who remembers The Dark Crystal (1982)? If you do, you grew up in a really good time to be a kid. Well, +Netflix seems to know their demographics well with shows like Stranger Things, and Voltron getting multiple seasons they are looking to cash in on the nostalgia with The Dark Crystal: Age of Resistance. Anyone miss the days of puppet work and animatronics in films? There was a time when it was considered cutting edge and films like John Carpenter's: The Thing (1982) won academy awards for those types of effects. 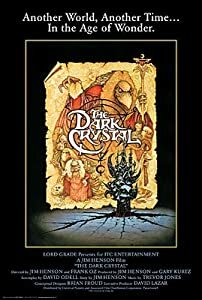 The same year, a pretty awesome film from the mind of the late Jim Henson created The Dark Crystal. A sci-fi fantasy film that was a great escape for kids in the 80s and had its share of merchandising. This classic does not come up in conversation enough but if you mention, it is one fan's remember. Check out the trailer below that features Henson talking about his excitement for the film and the concept art of the villainous species in the film, the "Skeksis". If you remember anything about the original film, the Skesis were in power and using the life force of the people they controlled to keep themselves alive. They rounded up those they ruled and drained them of their "essence" by force so they could consume it and live longer to the point of decomposition.